Our courses are Florida DBPR approved to satisfy your electrician continuing education requirements (Provider ID #0005624; ECLB CE Provider License #PVD483). Complete the continuing education to renew your FL electricians license today. All of our courses can be completed At Your Pace Online to help you meet the state's requirements to maintain your license. Once you finish your class you will have an official certificate of completion to save for your records, and we will report your course completion to the state for you. 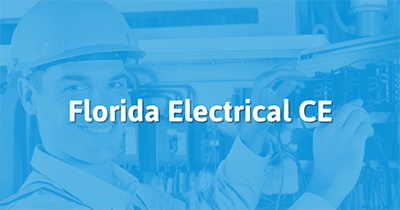 In the state of Florida, electrical contractors are required to obtain 14 hours of continuing education every 2 years. 7 hours must be technical/Code-related. 1 hour must cover workers' compensation. 1 hour must cover workplace safety. 1 hour must cover business practices. 1 hour must cover Florida Building Codes Advanced module. 2 hours are considered 'general' and can cover any of the topics listed above. If your license was issued less than 12 months prior to August 31st of the renewal year, you do not owe any continuing education. This course is designed to fulfill 7 hours of technical credit for electrical contractors and covers 2017 NEC content. Our 2017 NEC 14 hour course is state approved and will meet all of the continuing education requirements for Electrical Contractors. Our 2017 NEC 14 hour course is state approved and will meet all of the continuing education requirements for Alarm and/or Electrical Contractors. This course is approved for 2 Hours of Florida False Alarm Prevention credit. 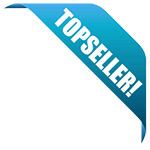 This course is approved for 1 Hour of Florida Rule & Law credit. Your above referenced course(s) will expire May 31, 2019. The ECLB sponsor and course number must be used when making references to your classes and should be printed on applicable course materials and advertisements as per Rule 61G6-9.012(3), Florida Administrative Code. Please remember that with the exception of Fire Alarm Systems Agent and Alarm Systems Agent courses ECLB Rules & Regulations course attendance files must be electronically submitted to the department no later than 30 calendar days after course completion or within 10-business days if the course is completed the same month of a licensee's expiration date. The software to accomplish this is located at our website for downloading: www.MyFlorida License.com, <Bureau of Education and Testing>, <Providers / Instructors>, and download the "Provider Continuing Education Download Software". You may also want to download and/or print out the instructions for using the reporting tool (User Guide for the Reporting Tool and/or Technical Guide for the Reporting Tool). Under the provisions of Chapter 489 FS.